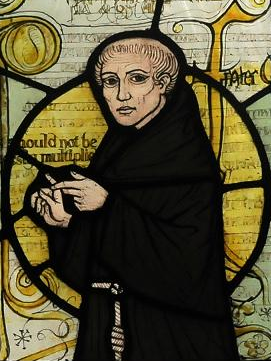 William of Ockham is co-equal along with Aquinas and Duns Scotus as a leading thinker of the late middle ages/scholastic philosophical period. A Franciscan friar, in life Ockham got into a great deal of trouble with the church, and his thought influenced later thinkers and critics of the church. Perhaps more important was his philosophical work dealing with logic, famously professing the rule called "Ockham's Razor", that if something can be explained without outside variables or circumstances, than that is likely to be the right approach.